Guzman Aymara began painting as a child in his native Peru. He received his formal education at the Escuela de Bella Arts in Lima. He describes his painting style as: " A reflection from the eyes to the brushstroke of the happiness and enthusiasm of a calm summers days." The source of his art is the land itself. In roaming the Peruvian countryside for hours on end, he meticulously searches for the artistic inspiration and ideas that will be magically transformed onto canvas. The vibrant yet playful pallete used his art, for example, is reflected in the countless scenes of sun-soaked landscapes. Aymara says that he is ultimately " a painter of light." The constant and contrasting interplay of shades and light are characteristic of an Aymara painting. 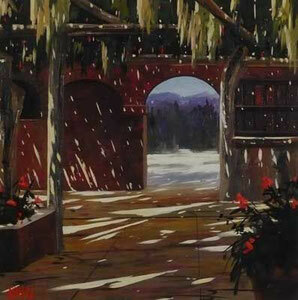 The paintings are best placed in the quiet spaces of homes and offices. Their tranquil nature, characterized by the mixture of thousands of shades of light, are conducive to reflection and quiet admiration. Moreover, his paintings display an incredible harmony that transcends the seeming disharmony of everyday life. Aymaras paintings offer the viewer something refreshingly different. The best works are the ones that convey all the colors, sights and sounds of the vibrant Peruvian landscape. It can be the sunlight over the vines; the dazzling light of an outdoor terrace; the sublime light of the late-afternoon sunset, for example, that give Aymaras work it's superlative quality. Guzman Aymaras work is widely enjoyed and collected in North America and Europe. The accolades keep pouring in for this gentle Peruvian, who is steadily gaining in reputation as one of the eminent South American artists.